Just last night chatting with some girlfriends about the adventures of dating and the joy of men, we spoke about experiences that were incredibly fun and expansive and others that did not turn out as dynamic as we’d have liked them to. I remember talking with one of my closest friends, a man, in the midst of my second divorce and he asked me, how is that you can jump back into the world open to the idea of an amazing man showing up after all you been through. It didn’t occur to me that I should be bitter against all men after experiences with one who was less than kind. There was another amazing male friend in my life who used to joke with me that men loved me because I was safe, meaning they could be and express themselves with me without judgment. I didn’t fully grasp what that meant at the time. I have an interesting hidden desire to invite more men out from behind the places they have been taught to be quiet, the roles they have been locked into and above the overall stereo type produced by the few who use their power to harm, take and brutalize. I’d love to see even more men embracing their dynamic self outside the relationship rules of being wrong, needing to change and be the missing piece that completes the pie. I’ve certainly lived an interesting life and had my issues with abuse, abandonment and the core belief of being unworthy. I’ve certainly had my moments of internal insanity that tortured those around me. Once I took my children to meet the first man I was ever engaged to, two decades later and while chatting about the past, he said he would listen by the door to what song was playing so he knew what to expect when he walked in. All of them, my kids and him, said at the same time; Moondance by Van Morrison. I wasn’t the kindest partner, I was a little insane. I made choices to change and it wasn’t all about the above, a great amount of what changed in my life was and still is through the perspective I have on things. I had an interesting relationship with the man who raised me, the one I call dad. As a sensitive kid, I cried a lot, I took a lot personally and he said things that, at the time, devastated me. Today some of those same things are the questions I ask myself everyday. Today, my dad is one of the kindest, most generous men I know and a huge contribution to my life, I could not see that in him as a kid. Then, I could only see through the lens of my sensitivity and desire to be important to him. When I would cry, he would say, sweetheart, is it going to matter 100 years from now. At the time, I thought, I don’t know dad but it matters right this minute. Today, that same question changes a lot of the situations that arise in my life. My relationship to and with men may come from the fact that I grew up surrounded by boys, had three dads and raised four sons. I also wonder if it comes from an inherent ability to see people behind the presentation they show the world, to be able to sit with someone and simply get them. I can see the kindness when it’s there and even when they hide it. I adore men and I don’t look to them to see where I can change them, what they are going to do for me or how they will rescue me. When I was first introduced to Access Consciousness I read and/or listened to the book Being You, Changing The World by Dr. Dain Heer more than a dozen times. I truly resonated with what he was saying and it reminded me of the interesting way I viewed life and relationships. 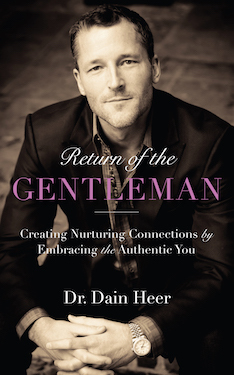 I listened further when I read the book, The Gentleman’s Club by Gary Douglas and when Dr. Dain aired his YouTube Series, The Return Of The Gentleman. As a woman, as a mother of sons and simply as a person on this planet, I was shouting, YES… Let’s have more of that…. You may see this book and think, it’s about time someone writes a book to help men get it, I have heard that from the mouths of women, and there is an essence in that which is true. It is about time someone spoke out about what has been living in silence and it’s a book for everyone including women. What kind of relationship can we all create with some insight into the inner lining? Grateful this has shown up for men all over the world and the new possibilities we can all choose to be.